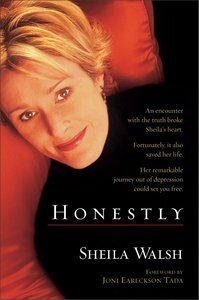 'Honestly' takes readers on a journey past the walls most of us put up and into the recesses of one woman's heart. With rare grace, Sheila shares the story of her pilgrimage. "I know firsthand the desperation a human soul can feel when every earthly remedy fails. I also know how powerfully God can intervene when we fall on our faces before him." -Sheila WalshTalented and beautiful, Sheila Walsh seemed to be on top of the world. But behind her public success as a performing artist and talk show host, a private story was unfolding. Unable to cope with the inner turmoil that plagued her, Sheila stepped down as co-host of television's 700 Club to deal with a pain too pressing to ignore. Honestly takes you on a journey past the walls that most of us put up and into the recesses of one woman's heart. With rare grace, Sheila shares the story of her pilgrimage-the journey of a soul as it moved from hopelessness, to honesty, to freedom, and, ultimately, to a life of deepened faith and joy. Freedom is something Sheila Walsh holds dear because she knows what it means to be bound by depression and fear. The author of multiple best-selling books for adults and children, including the Gigi series; God Little Princess series, Sheila is also a Grammy-nominated singer. Before joining Women of Faith, she co-hosted television's The 700 Club and had her own talk show "Heart to Heart with Sheila Walsh". Sheila lives in Texas with husband Barry, son Christian, and a menagerie of furry friends.